Funk Boiler Works goes out of its way to install conventional American equipment with life expectancies of 20 to 30 years, where many condensing boilers have life expectancies of only 7-8 years. The savings is in the longevity and higher efficiency of primary/secondary piping. We also offer boiler rentals! Please call us to inquire about pricing and models available for rental. 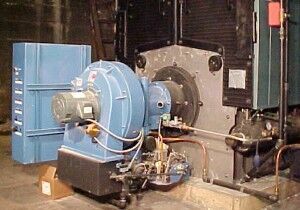 Cast Iron Boilers - HB Smith, Weil McClain, and Burnham are all cast iron boilers. Cast iron boilers are easily accessible to buildings. They are sectional boilers and are built in place. They have an approximate life span of 20 years. Steel Boilers - Columbia, Hurst, Cleaverbrooks, Triad, York, and Burnham are all steel boilers. These one-piece boilers need larger entry ways to properties to get them in the buildings. They have an approximate life span of 40 years with a re-tubing. Condensing Boilers - Lochinvar, Burnham, Hydro-therm, and Ray are all condensing boilers. Condensing Boilers are high efficiency boilers which in most cases fire on gas only. They have low stack temperatures which create a high moisture content. Burners - Power - Flame, Industrial Combustion, Webster, and Carlin are all capable of burning gas or oil. To schedule a complimentary customized Energy Efficiency Analysis to determine what products best suit the needs of your business, please contact our sales department today. Survey the rest, then call the best – contact Funk Boiler Works Inc. today at 203-934-3066!